This is a scalable context timeline. 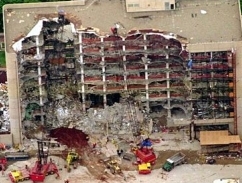 It contains events related to the event May 1-3, 1997: Three Militia Members Arrested, Charged with Weapons Violations; FBI Alerted by Pro-McVeigh Protests outside Denver Courthouse. You can narrow or broaden the context of this timeline by adjusting the zoom level. The lower the scale, the more relevant the items on average will be, while the higher the scale, the less relevant the items, on average, will be. Davidians Alerted - A local news reporter’s discussion with a US postal official inadvertently “tips off” the Davidians to the impending raid (see Before 9:45 a.m. February 28, 1993). 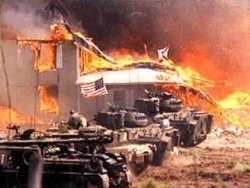 Davidians Resist - The Davidians successfully resist the raid (see 9:30 A.M. and After, February 28, 1993), in the process killing four BATF agents (see 11:00 A.M. and After, February 28, 1993) and bringing about a standoff between themselves and the FBI (see 12:00 p.m. February 28, 1993).